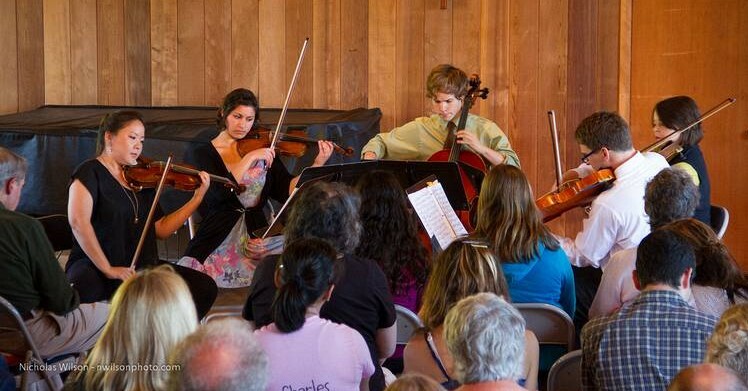 The Mendocino Music Festival is offering twelve string players full scholarships for the 2019 Season. This program is limited to serious musicians between the ages of 18 and 26. The Emerging Artists Program includes coaching in an intensive 2½ weeks of chamber music as well as participation in the Festival Orchestra in the company of professional musicians from the Bay Area, local artists, and soloists of national and international renown. The Festival, now in its 33rd season, takes place in one of the most spectacular spots on the northern California coast. Participants should arrive in Mendocino on the afternoon of Thursday, July 11, and remain through Saturday, July 27. Participants will perform in a chamber music recital and three orchestral concerts, each one with a different program. You will be notified of your acceptance by March 31, 2019. Each participant will receive a $200 stipend on July 11. Host families will provide participants with lodging, kitchen privileges and, in some cases, breakfast. Although the MMF will provide substantial morning snacks on orchestra rehearsal days at the Festival tent, participants are expected to provide for their own meals and transportation. Jay Zhong began studying the violin at age four and started his professional career with a recital on the main stage of New York’s Carnegie Hall. He has earned critical acclaim for his solo recitals and chamber music performances across four continents of the globe. He has been a full time professor and master class teacher in many universities throughout the United States. Jay has recorded Ysaye’s Six Solo Violin Sonatas and written his pedagogical findings in his book, A Violinist’s handbook, A Simpler Manual to Learn the Instrument. He is currently the Associate Concertmaster for the Santa Rosa Symphony and is on the music faculty of Sonoma State University. Susan Freier, an internationally known violinist and longtime member of the Ives Quartet at Stanford University, performs with the S.F. Contemporary Chamber Players. She earned degrees from Stanford and Eastman School of Music and was asked to join the Chester Quartet, which went on to win the Evian, Munich International, Portsmouth and Chicago Discovery competitions. She has been a participant at the Aspen Grand Teton and Newport festivals, and has recordings on a number of prestigious labels. Formerly an artist-faculty member of the Pacific Music Center, she now teaches and performs at the Orfeo, Telluride, and San Diego music festivals. Cellist Stephen Harrison has been a member of the Stanford University faculty since 1983, when he returned to his native Bay Area to co-found the Stanford String Quartet. In 1998 he became the founding cellist of the Ives Quartet and is now co-Artistic Director of the Ives Collective. These ensembles have commissioned works from composers such as William Bolcom, Ben Johnston, Elinor Armer, and Dan Becker. Cellist of the San Francisco Contemporary Music Players since 1986, he has performed internationally and recorded for the Naxos, Music and Arts, CRI, New Albion, Newport Classics, AIX, New World and Bridge recording labels. Recordings (CD/DVD) may be submitted with paper application. Links to online video or audio files may be included in online application. Live audition may be arranged soon after application due date. One movement each from two contrasting pieces of applicant’s choice. You’ll receive an immediate email confirmation of your application. Download and print a paper application to submit by mail. The Emerging Artists Program began in 1991, the Mendocino Music Festival’s fifth season, when the Young Musicians Scholarship Program was inaugurated to nurture young classical musicians in the community and beyond, and to reinforce orchestral resources. Every year 8-12 instrumentalists—talented wind and brass players, string players and pianists—were chosen to play in the Festival Orchestra and to present chamber music programs, coached by professionals. By combining the best features of a music camp with a rigorous professional festival, the program enabled young players to grow musically while enjoying camaraderie with fellow participants and the festival musicians. Like all visiting musicians, the students were housed with local families, allowing them to interface with the broader community. Beginning in 1998, the program focused exclusively on string players. In 2007, Karl Goldstein, who served as director of the program for many years, changed the program’s name to “Emerging Artists.” Other directors and coaches have included Anne Crowden, Bonnie Hampton, Susan Waterfall, Burke Schuchmann, Christina Mok, Eric Sung, Jill Brindel, Roy Malan, Susan Freier and Julie Feldman, the current Program Director. The Program Alumni Page gives an impressive peek into the value of this program with personal statements from many of the more than 160 alumni since 1991 on the importance of the Festival experience in their development as musicians, and on their achievements and career paths. The alumni represent an international community of young musicians who came together for a magical summer experience, most of whom have gone on to have successful professional musical careers as players, teachers and administrators who nurture young people themselves. The Festival is proud of the Emerging Artists Program and remains committed to encouraging, nurturing and showcasing young artists each season to enable them to make significant contributions to the communities where they live and play. This program is free to participants thanks to the generosity of the donors of the Mendocino Music Festival.